Here come the brides! 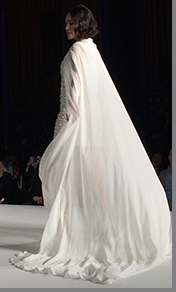 Once again, Designer Carmen Marc Valvo excited the imagination with his stunning Carmen Marc Valvo Bridal Fall Winter 2018 collection. 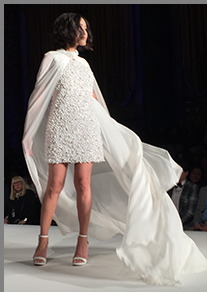 Luxury Experience is pleased to provide you with the experience of being at the Carmen Marc Valvo New York Runway Show presented by Style Fashion Week at Cipriani 42nd Street® in New York City in February 2018, by showing you some of the exceptional collection highlights. 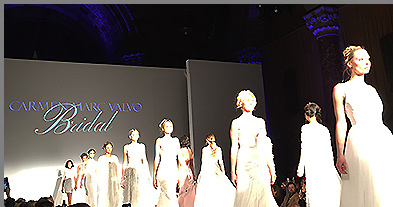 Designer Carmen Marc Valvo has long been a leader in high-end bridal and eveningwear since he founded his company in 1989. 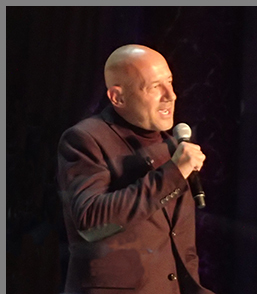 He is a designer that I have long followed and always enjoy seeing his runway shows as he continues to delight season-after-season with his creativity and stunning designs that have sophisticated classic elegance combined with timeless elements and exceptional attention to detail that make each of his gowns a standout. 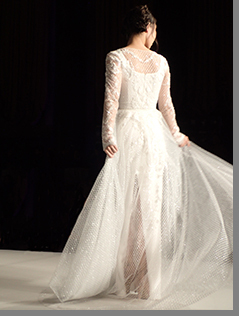 In an impressively large collection of spectacular gowns, Luxury Experience is pleased to provide you with a few ofthe many dazzling collection highlights experienced during the Carmen Marc Valvo Bridal Runway Show. 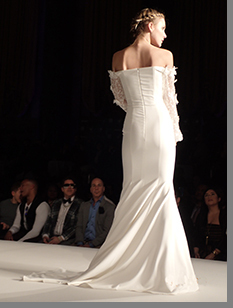 Gown 1: Style, elegance and romance went hand-in-hand with his off-the-shoulder gown with embellished bell sleeves and slight mermaid train. 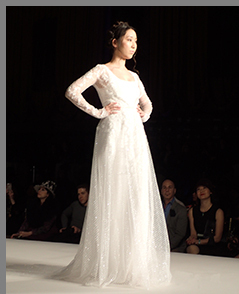 Gown 2: Another highlight was an attractive scoop-neck gown with fitted lace over-the-wrist length sleeves, and a full embellished tulle overlay skirt. Gown 3: Classically beautiful was his V-Neck sleeveless gown with embellished bodice that featured a graceful silk chiffon skirt. 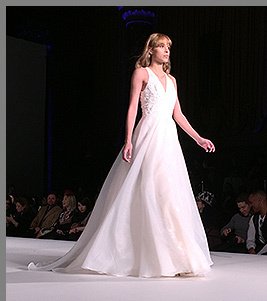 Gown 4: Cinderella gorgeous was a deep V-neck gown that fell into a soft full skirt. 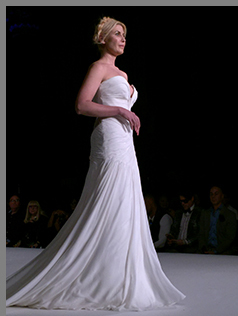 Gown 5: Ruching on the bodice and over the hips of a fitted strapless gown with plunging neckline gave it a sophisticated, sensual appeal with soft draping from below the hip leading to a long train. 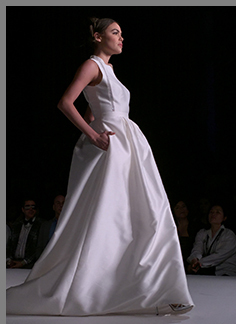 Gown 6: Vertical bodice embellishments added a touch of glamour to an attractive ivory statin full skirted gown with side pockets. 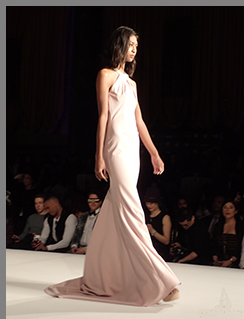 Gown 7: His pretty-in-pink halter bias cut gown featured an embellished collar and four spaghetti straps on the deep V back of the gown with short train. 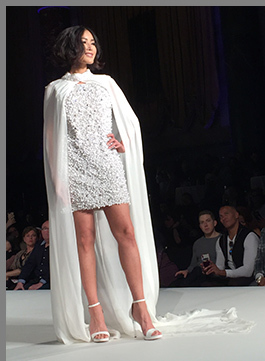 Gown 8: Carmen Marc Valvo went for the dramatic for the modern bride with his ivory beaded mini sleeveless sheath paired with a flowing cape with an embellished collar, that created a long train and was a runway show stealer. © February 2018. Luxury Experience. www.LuxuryExperience.com All rights reserved.